My love affair with history began in grade five when I was introduced to Marco Polo, Vasco da Gama, and the mysterious disappearance of David Livingstone in the heart of Africa. We read stories of the great explorers, and then built 3D maps of Europe or Africa or Asia, where we mapped out the travels of the great explorers. This love affair continues 40 years later while I follow the researchers of Parks Canada and the Canadian government as they explore the underwater wreck of the Erebus from the lost Franklin expedition of 1840s. So it is only fitting and timely that Lorimer has reprinted Mystery in the Frozen Lands. This adventure novel, set during the McClintock expedition of 1858, is narrated by cabin boy and nephew of Sir John Franklin, Peter Griffin. Aboard the ship Fox, the crew spent years searching for clues and possible survivors of the original expedition which had been sent to discover a Northwest Passage, thus opening an uninterrupted sea trade route with the East. Complete with vivid descriptions of life aboard ships before the age of steam, fierce winter storms, and the threats posed by both the animal life and the harsh environment, the author sets a pace that certainly creates a “page turner” of a novel. More than that, this novel is carefully constructed so that each chapter can be analyzed on a thematic level. For example, Chapter 8 is a study in language and culture differences as Peter and his Inuit companion discuss the meaning of words and how they reflect opposing spiritual values. Later in Chapter 16, the same two characters discuss opposing views of women’s roles in relationships. A careful read of this novel provides much room for inquiry and discussion into current values and ethics. I hope, however, that it will also ignite new interest into the history of exploration, or even inspire future explorers as we journey to the stars. 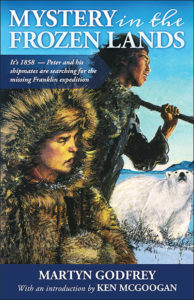 Curriculum Connections: Mystery in the Frozen Lands is just too good a novel to leave in the classroom library. Within the theme of Arctic exploration lie rich undercurrents dealing with social justice, hierarchical social systems, aboriginal values, women’s issues, gender equality, history of medicine and nutrition. Used in a small group novel study or whole class discussion, these themes can be isolated, dissected, then explored in greater detail. Mystery in the Frozen Lands is a must have for any teacher looking for a book that could inspire students to further research into the great age of exploration.